Finished a piece I had started earlier in the year. The challenge was to try and maintain their original color schemes with the new outfits. 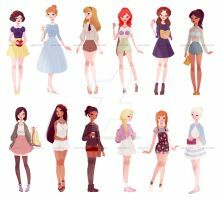 this is honestly one of the best "Disney princesses in modern clothing" pictures i've seen on the site. They look great, just look like they're heading out for a day as opposed to hanging out at the castle. Love the outfits, and yay they're all a normal size!! I love your unique style and modern fashion twist on the Disney princesses. You got all my favs!!! Oh my goodness, I don't even remember adding this to my faves. but I just happened upon it again and I love it! I'm so happy! Such a cute style, with both the fashion and drawing! Love this. I always like to see the Disney princess characters done in new ways. Great job on this. I really like the body shapes, poses, outfits... everything! One of my favourite Disney Princess Fanarts. 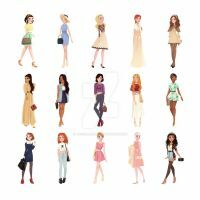 I love how individual all the girls look! Aurora looks like a biker girl which pleases me in all sorts of ways. Snow White's jeans are the best! Really fun lineup! I love how the poses and your lines flow. 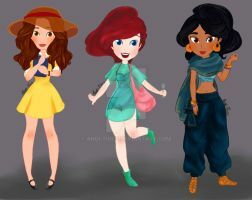 These are all so fun - I think my favourites here are Ariel, Pocahantas and Jasmine! Great picture. May I ask what was your setting for your inking in Manga Studio? Thanks! Well, I just use the default G-Pen for my inking. They are so modern, looks like the characters of a sitcom : "Stay tune for a new episode of D.I.S.N.E.Y"
Ok, I am so digging this. Love Jasmine's dress! All of the designs are adorable.